Located at the Federal Reserve Bank of Atlanta, the Atlanta Monetary Museum offers visitors a chance to explore an exhibit of historical artifacts to learn the fascinating story of money — from barter to modern times. Visitors can also learn about the turbulent history of banking in America and see examples of rare coins and currency. 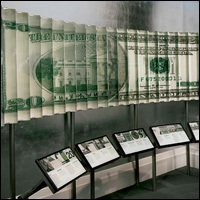 The museum features a display on the history of money, interactive exhibits explaining the Federal Reserve's role in the economy, and a view of the bank's automated vault and cash processing areas. Parking: Paid parking is available on the streets and in lots near the Museum. MARTA: Take the red or gold line to the Midtown Station. Out of the station walk east on Peachtree Pl., turn right on 10th St. and turn left on Peachtree St. The museum will be on the left.